as i must have said more times than either you or i care to remember, i really don't get out much. for starters, any sort of evening social life has to fit round the hours spent sitting on the leather chair of an evening writing all that you see before you. doubtless there are many of you who wish i would just go out once in a while, but we all have our crosses to bear. however, to what i really refer is the fact that i rarely remove my person from the island, and when i do, it is even more rarely in the company of the team colnago. so, by implication, i have little or no need of any sort of encasement to ensure its travelling safety. because it doesn't travel much. what does need to travel, however, is the seemingly endless supply of shiny new colnagos that gratifyingly head in my direction for a few weeks' holiday on the hallowed isle. these, along with the other bicycles i have had good fortune to test/review, usually arrive in cardboard boxes, from the enormous containers preferred by wiggle (on which it is likely council tax is due), down to the more conveniently proportioned boxes sent by almost everybody else. cardboard is a marvellous material, as it costs relatively little, weighs not a lot, and can be recycled when empty. what it doesn't do to quite the same degree, is shed water, remain in pristine condition for more than a few days at a time, and perhaps most importantly, resist the earnest bruising of haulage contractors, railway employees and aircraft baggage handlers. i have been very fortunate that none of the considerably expensive machines transported to washingmachinepost cottage have suffered any damage whatsoever, but one feels that it's only a matter of time. so when visiting the cycle show at earls court in october, i happened upon bike box alan, displaying rather sturdy looking plastic boxes capable of swallowing a road bike and its wheels in one gulp. this seemed like the very item about which you should know, particularly after yesterday's post regarding all those exciting randonees, continental rides, sportives etc. for which you will all now require a safe method to transport your velocipedes. i'm none too sure that you'd take me too seriously if i simply popped the c40 into a red box and took it on the bus to portnahaven and back. that would prove very little, other than the fact that islay's bus drivers have to put up with more eccentricity than they're really paid for. 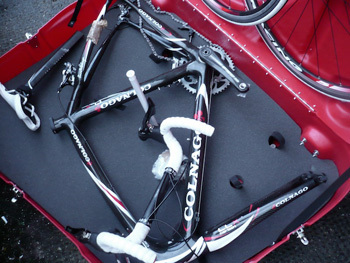 so i spoke to the folks at colnago and arranged, with their full co-operation, that alan would ship an empty box to colnago uk, and they'd place a shiny colnago clx 2.0 to suffer the infractions of the carrier from gosport to glasgow, and glasgow to islay. and when the road test is over, it'll go back in the same manner, but the opposite direction. so just a few weeks ago, the big red box arrived off the carrier, having been tastefully decorated with colnago logos and transfers to match its contents. the box itself is manufactured in the uk from fairly heavy duty recyclable plastic, moulded on one side to accommodate the two wheels. there are two sturdy metal latches on one end, one on the top, and another on the opposite end, keeping the whole shebang tightly closed. since the lid slots in under the base, there is little or no chance of anything falling in, or out, in transit. the latches close over metal loops allowing the use of padlocks for additional security. there are sturdy castors on the bottom of the case, cleverly inset into the moulding, with the front set steerable. 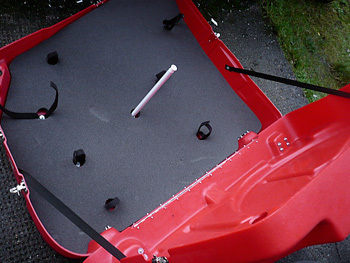 two grabhandles are also moulded to make it easy to manhandle in the safety of your own forty-foot trailer. while the box weighs around 5kg or so, assuming the bicycle inside isn't hitting the bump stops, lifting isn't too strenuous an affair. the box is waterproof to the extent that leaving it out in the pouring rain for an hour or two (i left it for half an hour just to check) won't cause any distress to bicycle or owner; however, submerging in the sort of floods various parts of the uk have suffered recently would give you a wet bike. 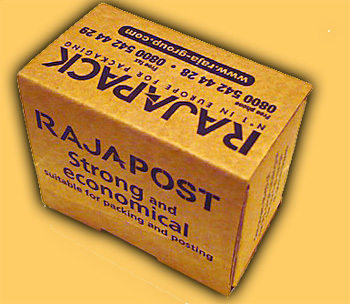 to fit a bicycle inside the box, the seatpost needs to be removed, as do both wheels. the latter fit into designated places in the lid, hiding behind a thick piece of shaped foam padding. the base has, securely affixed, a steel tube that rests in a dimple moulded into the lid, thus preventing anything from crushing the two sides together. the bicycle wouldn't like that. this latter fits through the main triangle of the frame, and numerous velcro loops are available to strap the frame into terminal immobility. in the colnago's case, the bars had been removed from the stem and sat on top of the frame, while the forks and stem had been turned sideways. the seatpost and saddle were velcroed in place. test bikes never arrive with pedals, but if they did, those would also have to be removed. alan told me at the cycle show that he had frequently demonstrated the strength of the boxes by standing on their sides while something expensive was sleeping inside. and so did i. in fact, i jumped up and down a few times (it's ok, i cleaned my feet first). best i can do is tell you that the colnago is being ridden scuff and scratch free. we are strange creatures when it comes to our bicycles: we're happy to spend ludicrous amounts of money on them that has little or no chance of making us much, if any, faster. yet when it comes to protecting our not inconsiderable investments, we either pop it in one of the aforementioned cardboard receptacles, wound with a bit of bubble wrap, or it goes in a fabric bike bag with a shoulder strap. i used to work at an airport when i was a student, and several of my fellow students worked in baggage handling. assuming the standard of student hasn't changed too much in the intervening years, i wouldn't transport a bike in a soft case by plane. the bike box does exactly what it says on the tin: safe as houses. there are various options available, including a degree of customisation (such as the very effective colnago livery on this review model), starting at £389. i will very happily entrust the colnago clx 2.0 to the open arms of the islay-glasgow carrier, safe in the knowledge that when they pass it on to the chap delivering it back to gosport, both box and contents will arrive in the same condition they left me. very impressive, it's red, and it says colnago on the side. 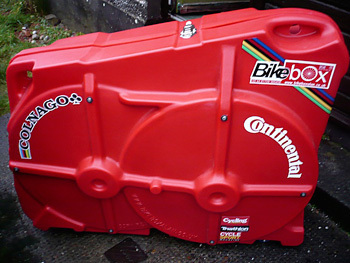 bike box also offer a wheels case built to the same standard for only £175.